The half hour or so before dinner is always a bit of a challenge since the kids are hungry and needing more attention than I can give them while I'm doing the 'hot bits' of the cooking. So this is the solution I came up with this weekend. 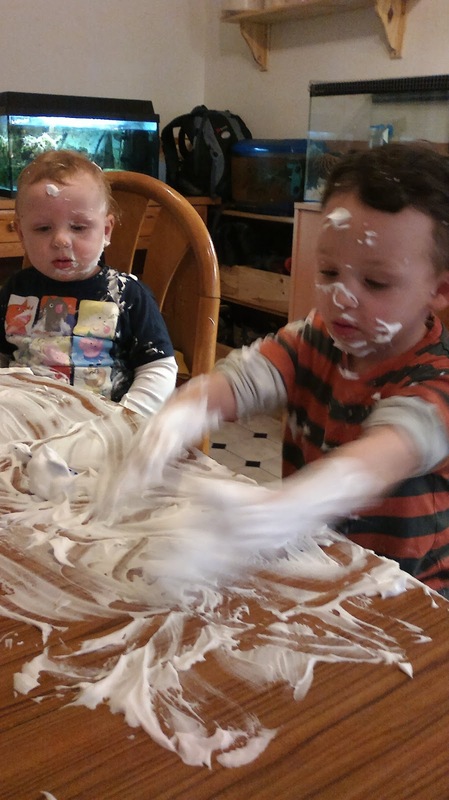 I gave each of the boys a generous squirt of value shaving foam bought for home experiments and messy play. The value foam is best as it has less perfume in it, and it is the perfume that can cause skin irritation and itching. It is also an insanely cheap resource - I paid just 25p for it at our local supermarket. The first time Ollie was given shaving foam to play with was as a nine month old baby at nursery, and I have to say I was very dubious about this material and actually quite worried, so I did a lot of ringing around and internet searching into its use and potential toxicity. It turns out it is very commonly used in preschool settings and is just soap, so if ingested the worst that will happen is a laxative effect. I still think nine months was too young for Ollie to have been left alone to play with it, as he had got it in his eyes as well as eating a lot and was in a sorry state when I picked him up that day. For this reason I've held off using shaving foam for play with Toby until recently, but he seems to have got the idea quickly that this isn't tasty and not to rub it on his face. Both boys played happily with the foam for about ten minutes, at which point Toby got bored and 'asked' to be released from his booster seat. Ollie however kept playing with it for half an hour, filling up various small containers such as milk powder scoops, smearing it and squishing it. I then showed him that if he smoothed it out he could draw patterns in it. Ollie straight away started writing his name out, and then insisted that Matt and I both took turns in writing our names too, which he did his best to copy. I've noticed that his writing with a pen took a leap forward after this, so I think that presenting writing in a different way has stimulated an area of understanding that he hadn't reached before. I've seen examples of good practice in helping dyslexic children learn to write using trays of wet sand and their finger, so this foam play writing probably falls into the same category of multisensory learning. By tracing out large letters in the air, or in another medium such as sand, it stimulates the brain differently to writing small letters with a pen. Even for children as young as Toby, all that squishing and smoothing is building fine motor skills which ultimately help to prepare them for more complex tasks. 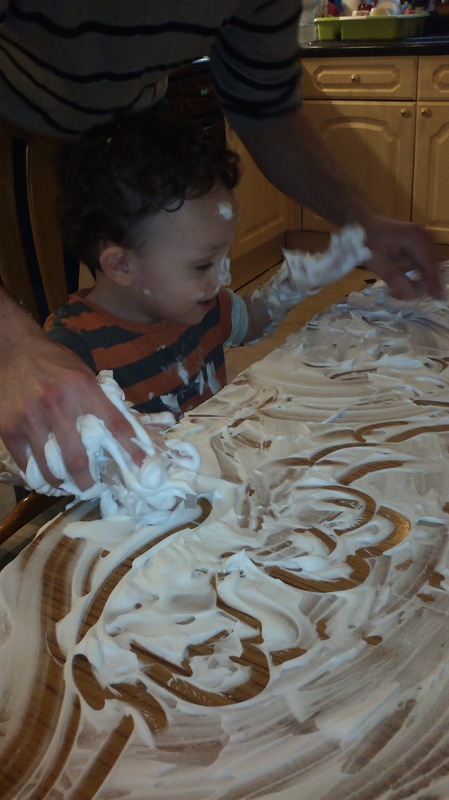 A great benefit of using shaving foam in this way is that because it is just soap, although it counts as messy play a quick wipe with a cloth and for once the table was actually cleaner after we'd played on it than before, perfect for getting ready for dinner. What an amazing idea Maz :) I am storing up all your play tips for when Libby is older.